Congratulations to "Janet K." the winner of Vella's giveaway. Thank you to all who participated! In some respects, writing Touch Of The Wolf, my Entangled Ignite romantic suspense, took root years ago when I was writing Native American historicals. While researching those nine stories, I amassed a library of Native American books. The real gem is Reader’s Digest’s America’s Fascinating Indian Heritage. My copy of that comprehensive book is marked up and beat up, and held together with a large rubber band. I’ve relied on it dozens of times. It became invaluable while I was plotting Touch Of The Wolf. I had a murder, a woman desperate to learn who had killed her mentor and why, and a man torn between protecting her and defending his heritage. In order to pull off a suspense, I needed to know how someone could possibly justifying killing a human being—something far outside my personal comprehension. Fortunately the Fascinating Indian Heritage section on the northwest coast traders and fishermen supplied the answer. I had that light bulb moment! Granted, I had to take liberties with what anthropologists and archaeologists have concluded about ancient Native American life there but who knows, maybe I’m right. What am I talking about? If I told you, I’d be giving away a great deal about the book I worked so hard to create. Hey, a girl has to have her secrets, right? Or more to the point, a writer has to draw out that ah-ha moment. What I can tell you is I had a marvelous time immersing myself in the world, traditions, and beliefs of ancient Pacific Northwest Native Americans and coupling that with a modern day murder mystery and two people falling in love. And as if that wasn’t enough, I made a wolf spirit part of the saga. All I’m asking readers is that they suspend disbelief. She eased her stiff body out of the vehicle, locked the doors, and turned to face the forest. It seemed to be waiting for her, ready to pass judgment on her. She paused and listened, then realized she’d been hoping to hear a wolf, which wasn’t going to happen because wolves no longer existed in the area. She checked to make sure her trunk was locked. She’d debated leaving the mask behind, but in the end had decided to bring it along, well hidden in the trunk. She couldn’t begin to count the number of times she’d thought about the mask during her drive. She’d wondered what had been on the long-dead craftsman’s mind as he worked on it. How much soul-deep spiritual belief had flowed from his heart through his fingers. The question she most wanted the answer to was whether he’d left something of himself in the work. Maybe that’s what had been behind the howl she’d heard the other day. An ancient Native American reaching through to the present. You imagined the sound, she told herself. Just the same, she slid her hand under her shirt and stroked her tattoo. Doing so eased some of her tension. After climbing the four steps leading to the office and reaching the porch, she reached for the knob. Before she could turn it, the door opened. She stared up at a man dressed in Forest Service olive green, who was looking back inside, giving her a moment to study him. He wasn’t particularly tall, probably not quite six feet. His shoulders were broad, his chest and arms substantial, belly flat and thighs thick. Whatever life throws at me, his form said, I can handle it. He turned to her. Deep-set coal black eyes regarded her. His face was more round than oval, and his dusky skin looked as if it spent a lot of time being subjected to the environment. She noted dark skin and thick, coarse, short black hair. He looked down at her, making her feel small and vulnerable. Exposed. She grew frustrated with her reaction. This was simply a man. She looked at his name tag. Jay Raven. Suddenly, she felt lightheaded and emotionally unbalanced. “Potlatch isn’t open to the public,” he said. I’m drawn to suspense in all its forms, including Man Against Nature. With that in mind I’ve written Whiteout, a book about a small group of people who find themselves pitted against a powerful winter storm. I’d love to give a copy of Whiteout to a reader. Giveaway ends 11:59pm EST Jan. 5th. Please supply your email in the post. You may use spaces or full text for security. (ex. jsmith at gmail dot com) If you do not wish to supply your email, or have trouble posting, please email maureen@JustRomanticSuspense.com with a subject title of JRS GIVEAWAY to be entered in the current giveaway. WHITE OUT sounds appropriate for northern Minnesota right now! We have at least 3 feet of snow and are entering the polar vortex that is headed for so much of the US. -70F below wind chills predicted for the next few days! Good time to curl up with a good book. You are a new author for me, Vella, and I look forward to reading your books. Thank you for sharing your stories and the awesome giveaway. Blessings to you . . . and stay warm!! Both books sound interesting... going to hop over to your site and look around! Thanks for sharing! Loved Touch of The Wolf! Given the recent weather, Whiteout fits right in. Both of your books sound so interesting! Really glad I had a chance to stop by and check out your post. :) Thanks for sharing! Whiteout sounds like an exciting read. Please enter me in your draw. Always happy to find another author to add to my list. congrats on the new release! 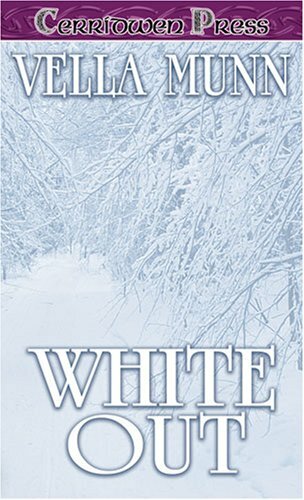 Whiteout sounds like a great read for this time of year :) Happy New Year! I would like to find that copy of Reader’s Digest’s America’s Fascinating Indian Heritage. I have reference books that deals with myths, legends, and fairy tales. I could see why my college adviser told me to major in theology/literature. I read these topics for fun not as a major.